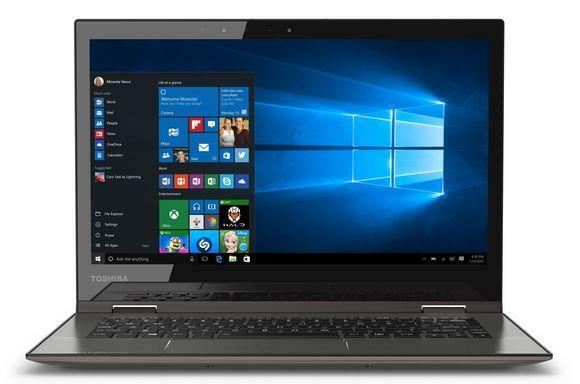 The Toshiba Satellite Radius 12 packs Intel's new Skylake processor, a 4K display option, and support for Windows Hello biometric security. The best thing about new PCs that come out during major technology transitions is they can be absolutely overflowing with the latest features. 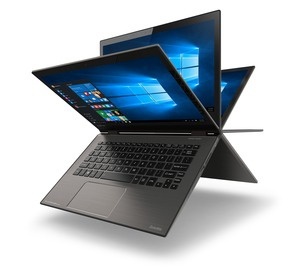 Toshiba’s new Satellite Radius 12 announced Wednesday is a perfect example of that. This 12.5-inch convertible is a slick, feature-stuffed laptop designed to turn heads and encourage envy among your techy friends. The first drool factor is the screen, which is a 12.5-inch IPS touchscreen display with 3840-by-2160 “4K” resolution. That’s four times the number of pixels in a 1080p display. At this point I’d like to direct all audio/visual purists to the comment section below to vent over whether an UltraHD display is worth it on a screen this size. For the rest of us, let’s just back away very, very slowly and move on, albeit not before noting that the Satellite Radius 12's color accuracy is certified by Technicolor and supports 100 percent Adobe RGB color space reproduction. In a nod to the awesomeness of Windows 10, the new Radius 12 comes with an infrared camera for use with Windows Hello. A new feature in Windows 10, Hello uses excellent facial recognition technology to let you login to your laptop with your face. Very few laptops support Windows Hello at this early point of Windows 10's lifespan. The Satellite Radius 12 will also come packed with as yet unnamed sixth-generation Skylake Intel Core processors. There’s no word on how many different versions of the Radius 12 will be available, which means RAM and storage configurations are also unknown. The Radius 12 chassis has a brushed metal finish, and other niceties include a backlit LED keyboard. The convertibility of the laptop’s 360-degree hinge allows you to use it as a laptop, tablet, lay it down flat, tent it to make it a display others can see, or put it in laptop mode but swivel the screen for watching movies with the keyboard out of the way. Toshiba’s new Radius 12 weighs in just under three pounds and offers a slim 0.6-inch profile. The laptop will start shipping at some point between October and December. Pricing wasn’t announced, but don’t expect the fully bling-out version to be cheap. The impact on you at home: If you’re in the market for a new laptop it would be wise to hold off for a few months if at all possible. PC manufacturers are gearing up to release some solid Windows 10 machines packed with Intel’s new Skylake processors that can easily handle extra features like UltraHD screens and infrared cameras for Windows Hello. While you wait, now is the perfect time to peruse the tech news, as most manufacturers are showing off their late 2015/early 2016 gear during IFA Berlin. Check out PCWorld’s full IFA 2015 coverage for analysis and reports from the show floor all week long.